The SureStay Plus Hotel by Best Western San Antonio North just off Interstate 35 is an easy stop on the road. Were less than 5 minutes from Morgans Wonderland and Heroes Stadium. Our hotels friendly staff can help you plan excursions to destinations like SeaWorld San Antonio, the Schlitterbahn Water Park Resort or Six Flags Fiesta Texas all just 30 minutes away. Additional nearby destinations include the San Antonio River Walk, Rivercenter Mall, AT&T Center, the University of Texas at San Antonio and the Alamodome. Were also 15 minutes from San Antonio International Airport and 20 minutes from the Shops at La Cantera. Our San Antonio hotel is 15 minutes from downtown San Antonio, the Alamo Mission and San Antonio Zoological Gardens & Aquarium. 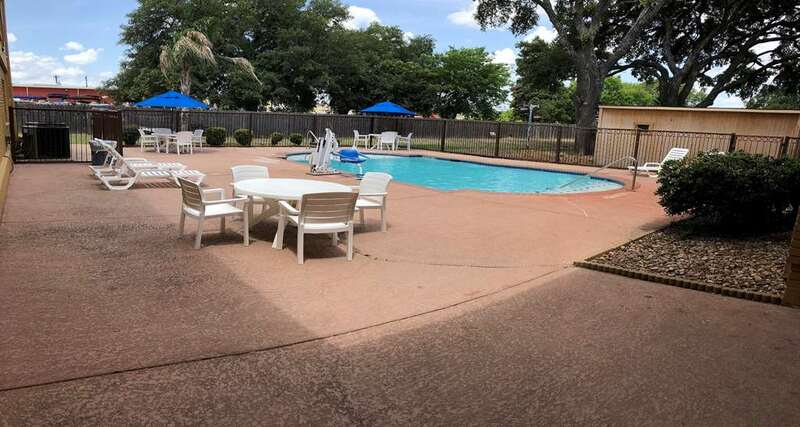 If you're traveling on a budget, take advantage of the amenities you need so you can enjoy the Texas Triangle for either leisure or business. Relax in our seasonal outdoor pool, work out in our fitness center and make corporate travel easy with our business center. Additional amenities include a free full hot breakfast, free Wi-Fi, free coffee, free weekday newspaper and guest laundry facilities. Youll find rooms that are clean and inviting to make your stay more enjoyable and a free full hot breakfast every morning to help you get back on the road. Our non-pet-friendly rooms offer comfort and convenience to business travelers and families alike. Enjoy our inviting guest rooms, all of which have TVs, refrigerators, microwaves and coffee makers. Make the most of your affordable trip when you stay at our SureStay Plus Hotel by Best Western San Antonio North. Book today! From: The North. Take I-35 South, Exit 168 for Weidner Road and stay on Frontage Road. The SureStay Plus Hotel by Best Western San Antonio North is located on the right. From The South. Take I-35 North, Exit 168 for Weidner road and make a U-turn at Wiedner. The SureStay Plus Hotel by Best Western San Antonio North is located on the right. From: San Antonio International Airport. Take 410 East, then take I-35 North, Exit 168 Weidner Road and make a U-turn. The SureStay Plus Hotel by Best Western San Antonio North is located on the right on Frontage Road. From: Downtown. Take I-35 North, Exit 168 Wiedner Road and make U-turn. The SureStay Plus Hotel by Best Western San Antonio North is located on the right on Frontage Road.